Aspiral Design inspires and delights children and adults of all ages with creative Tie Dye Workshops. We hold interactive, fun and simple Tie Dye Workshops across the Gold Coast. We inspire with a wide range of Tie Dye ideas to cater for everyone. 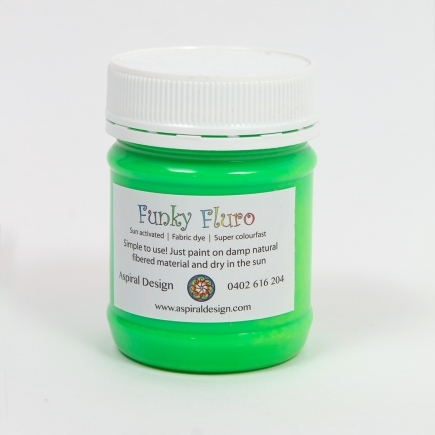 Aspiral Design manufactures its own unique Sunshine Dye and Funky Fluro Dye. 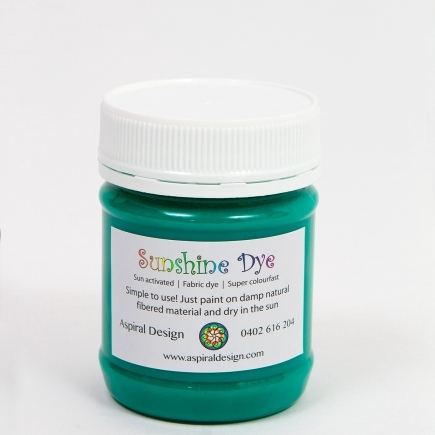 These dyes are super vibrant, non toxic, sun activated, easy to use and completely colourfast. I have participated in a number of Shoshana’s workshops across the Gold Coast, and have created many bright and colourful presents for my family and friends. I have had family in NZ request items to be made and sent over to them. Shoshana makes each workshop unique and fun. I would highly recommend anyone to attend and participate in any of Shoshana’s workshops. Shoshana from Aspiral Design has added colour to our City of Gold Coast Active & Healthy program since 2012. Through holiday programs the community have learnt how to create their own colourful creations through our Rainbow Tie dye workshops. What started out being for the kids has shown age is no barrier and we’ve had mums, dads and grandparents all joining in and taking home their own piece of unique artwork. Shoshana has also represented Active & Healthy at many events and expos, including the Womens Health & Wellbeing Expo 2015 where she delivered a popular colour therapy workshop. Shoshana has also been part of our weekend experiences where we’ve combined creatativity with activity to give fun opportunites for the whole family to come together in our beautiful parklands. Shoshana’s happy outlook, positivity and desire to create a colourful world are the reasons people flock back to her workshops and why she’s a great ambassador to spread our active and healthy message to the Gold Coast. I had an awesome time at my rainbow birthday party and everyone had a beautiful, bright, pillowcase to take home. Shoshanna is really nice and she taught us a lot about colours and art. Mum, my brother and I are now Aspiral Design/Tie Dye groupies and follow her around the Gold Coast when we can. Tie dying with Shoshana is such a wonderful relaxing and fun experience. Shoshana has extensive knowledge on colour therapy which can be applied to your life. We always enjoy getting a few of a our yoga students together and tie dying our clothes to freshen them up. Shoshana is also able to connect the colours to the chakras and our yoga postures. I highly recommend Aspiral Designs and Shoshana. 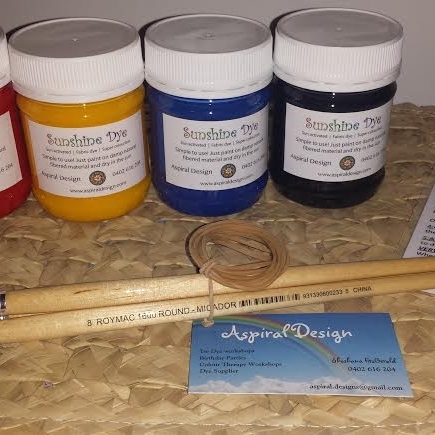 My daughter and I have become Aspiral Design happy hippy rainbow groupies, we have attended over 30 tie dying days and mastered over 60 Aspiral Designs for family gifts, personal treasures to wear & home linen to live with. We so much love the creative style Shoshana shares with everyone Big, Small & everyone in-between. I totally recommend Aspiral Design for learning, creating, fun and colour in any setting. I first came across Aspiral Design at a council funded workshop in Varsity Lakes. My 5 year old absolutelyloved making a couple of colourful pillow cases. When she arrived home to my 8 year old we had to find the next event or all hell would have broken loose. Our home is now slowly being taken over by tie-dye pillow cases, bags, shirts and face washers. My kids can not get enough of it. It sparks their creativity and it is just so simple yet the finished product is amazing. I would highly recommend taking your children to one of Shoshana’s colourful workshops, they never disappoint! We have loved Aspiral Design for some years through their wonderful School Holiday Workshops in Gold Coast Parks. Our wardrobes feature a number of unique colourful creations – some in 2 or 3 colours, others the whole rainbow hues – to the point that our whole family (even British Grandma and cuddly monkey) sport Aspiral Creations. So it was perfect to have a “Rainbow Party” for daughter Cassie’s 13th Birthday. Shoshana was sparkling, friendly, organised, inspiring and engaged the dozen guests flawlessly for over an hour. Each went home with both a Pillowslip and T-shirt as memory of the occasion and all the kids and their parents were impressed with their artistry. We would thoroughly recommend Shoshana and Aspiral Design. Be notified of special offers and events near you.